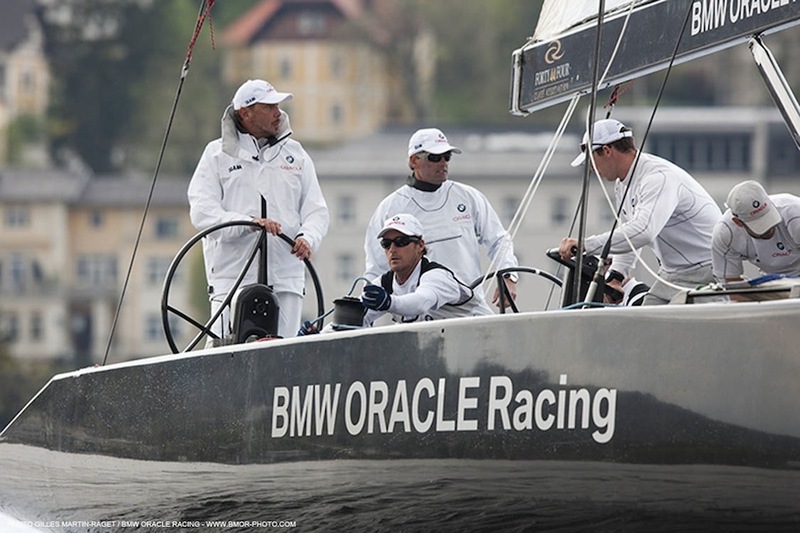 BMW ORACLE Racing has won the match racing regatta at the RC 44 Austria Cup, topping the table with a 7-2 record. Equal on points with Team Aqua, a win in the head-to-head match put the Ellison/Coutts combo on top. "This has been a great Series for us and we are very happy," Coutts said after racing today. 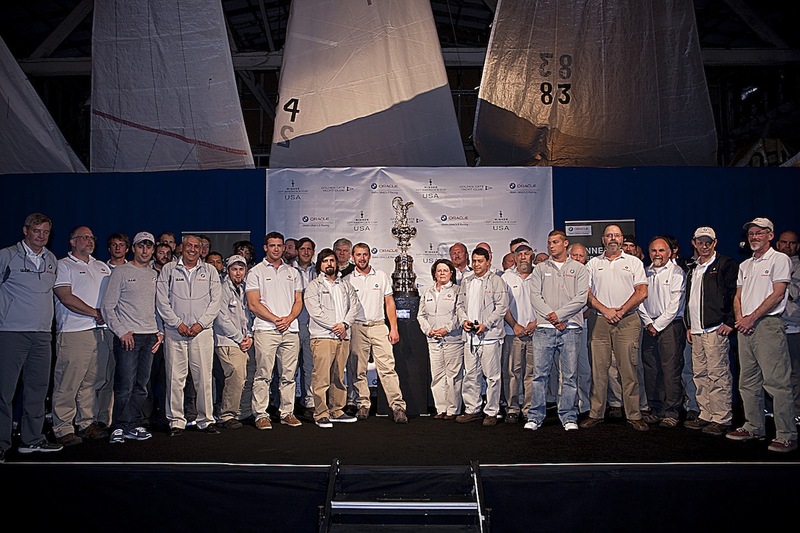 "We’ve been practicing well before this regatta, and Larry - who was steering - did a great job. Our match against Team Aqua was key, and both teams knew this. On such short courses the starts are essential and so is crew work. This put a lot of pressure on everyone, but the guys handled it well." Coutts went on to say that while the series win was a nice reward, the process was of equal importance to the final result. "It feels great to get out racing again," he said. "That's what we love doing, so it's been fantastic to get out on the water. I think any racing we do, it doesn't matter the type of boat at this point, any racing is valuable. Working together as a team and spending time together is important. We've got to figure out how our team will work in the future and these regattas give us an opportunity to begin thinking about that." Jimmy Spithill's RC 44 Challenge didn't get the results they were looking for today and finish the match racing portion of the regatta in sixth place. 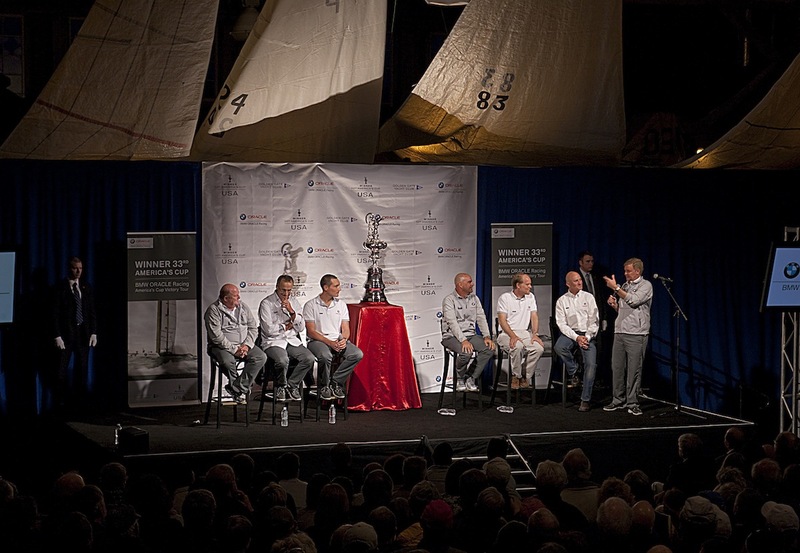 "This is a brand new team that I'm working with," Spithill said. "We have a lot to improve on, but that in itself is a nice challenge. It's fun to put a new group together and bring it along. It's challenging at the start but when it comes off it's quite rewarding." 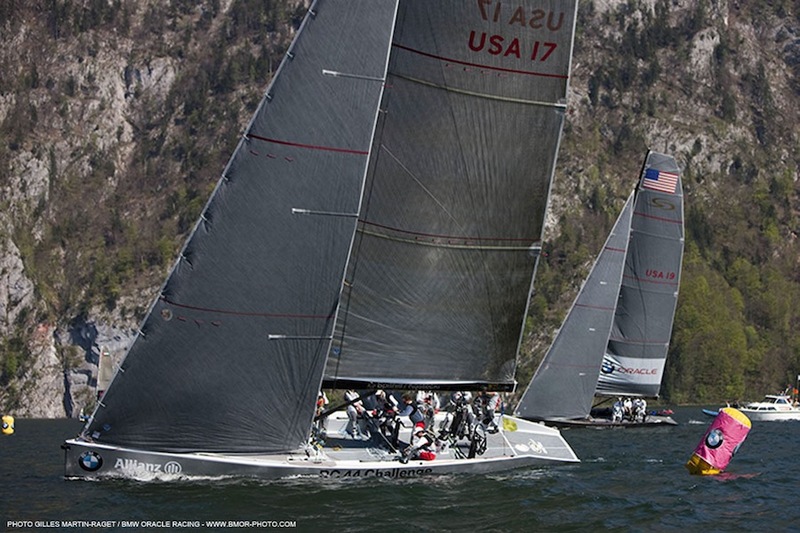 The RC 44 Austria Cup continues over the weekend with fleet racing. Full results and more available on the event website here. Early indications from the race course have BMW ORACLE Racing as provisional winners of the match racing portion of the RC 44 Austria Cup. 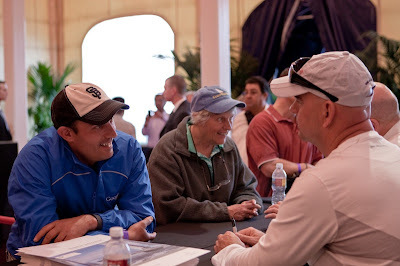 A win over Islas Canarias Puerto Calero in flight 11 should have sealed the deal for Larry Ellison, Russell Coutts and team. We'll have more from the guys - along with the full and final results - once they return to the dock. 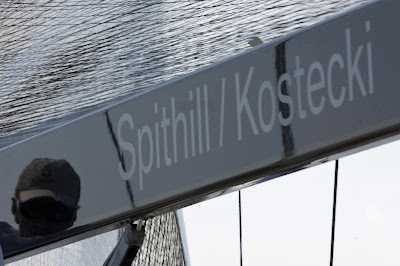 He may be the youngest skipper in history to win the America's Cup, and have dozens of match racing titles to his credit, but not even Jimmy Spithill can leave the circuit for two years to focus on multihulls and then return to monohull match racing and expect to sweep the competition. Yesterday, he and his team raced to a 3-3 record, good enough for equal fourth place in the 10 boat fleet with three matches remaining. Although Spithill was a little bit frustrated with the results on day one, he says he's happy with the process of sharpening his skills on the RC 44 Tour against some of the tap sailors in the world - think Ray Davies (ETNZ), Terry Hutchinson (ex-ETNZ, Artemis), Paul Cayard (Katusha, Artemis), to name just a few. Not to mention a certain Russell Coutts and Larry Ellison. "It was a little disappointing yesterday but on reflection I feel good about it. We just have to sharpen up a little bit. The level here is quite high. 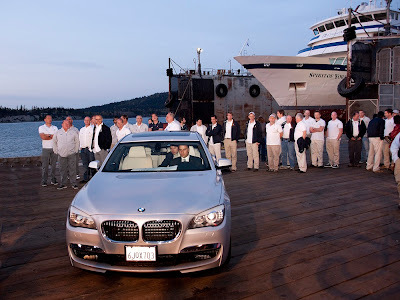 Of course you want to jump back in at the level you were at when you left, but it's going to take a little bit of time," he said before leaving the dock this morning. "The bigger thing for us is relearning the match racing and all of the moves. I think we're doing a good job between JK, Philippe (Presti) and myself of learning from our mistakes. I'm excited about today." 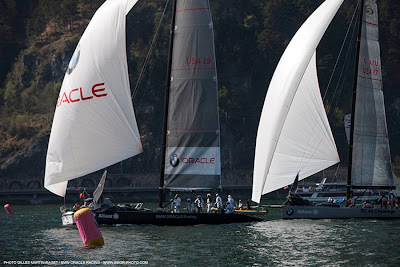 You can say it was for bragging rights, or call it a grudge match, or maybe it was just about who would buy dinner, but both teams desperately wanted to win the match between BMW ORACLE Racing (with Larry Ellison on the helm, Russell Coutts calling tactics) and RC 44 Challenge (Jimmy Spithill at the wheel, JK as tactician). In the event, the combo of Ellison and Coutts crossed the line ahead, on the way to an impressive 5-1 record on the day. And Ellison couldn't have been happier. "That was the most important race. Maybe more important than the whole regatta!" Ellison said jokingly afterwards. "We won by about half a boat length. It was all-on and it was a lot of fun. And now we're in a good position to win the regatta (the match race portion) if we sail well tomorrow." "These boats are a lot of fun to sail. It's great to be out here where everyone is driving identical boats. We were 5-1 and we had a chance to win the race we lost, so we're pretty happy with our sailing today." 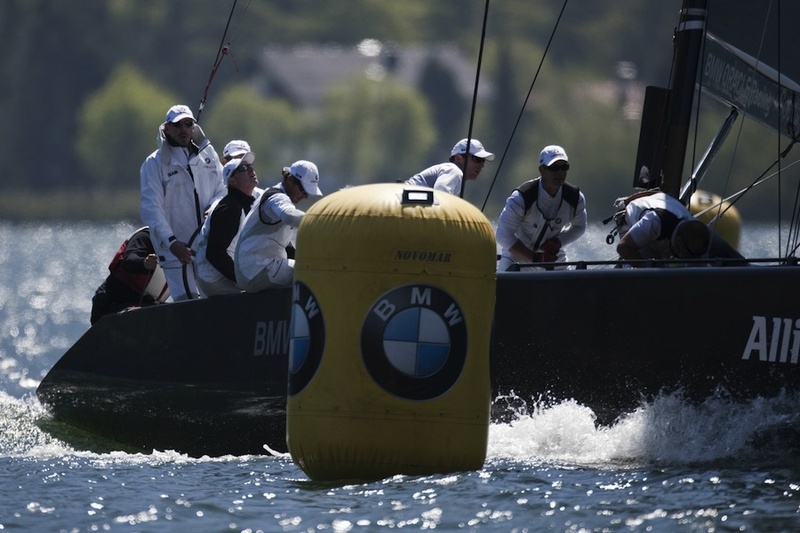 Indeed, BMW ORACLE Racing is sitting at the top of the table after day one, with that 5-1 record. 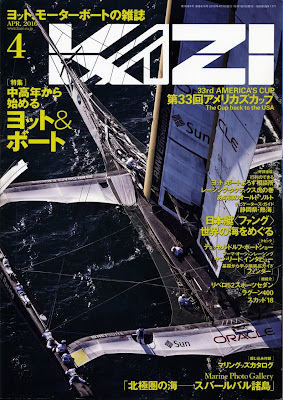 Two teams are one win behind and Spithill's RC 44 Challenge is in the middle of the pack on 3-3. "The level of the fleet is very, very tough. I was in the fleet two years ago and it's great to see where the level is now. 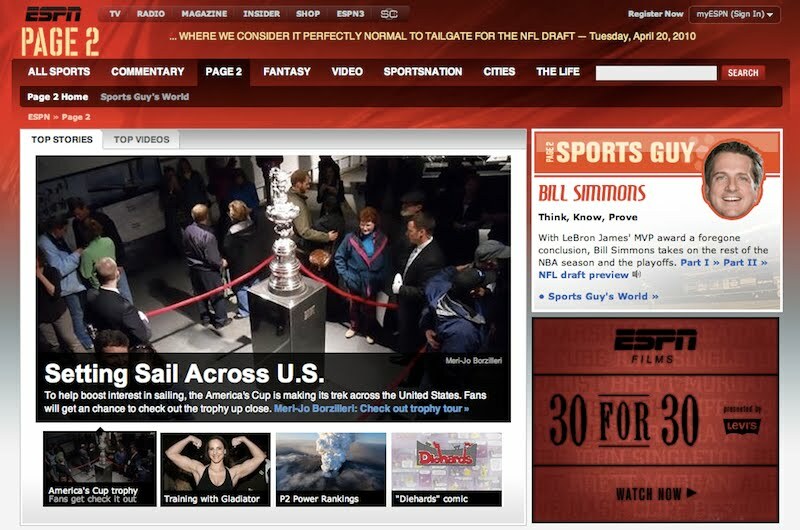 I really think it's the highest level out there," Spithill said. "I can only really point the finger at myself for today. My hand is up for the mistakes. But we're a new team now and we're going to learn and get better together." More match racing is scheduled for Friday. Full results and event information at the class website here. With the forecast promising fickle weather tomorrow, PRO Peter Reggio is churning through the flights today and there is a good chance he'll squeeze in the match between BMW ORACLE Racing (Larry Ellison, Russell Coutts, et al.) 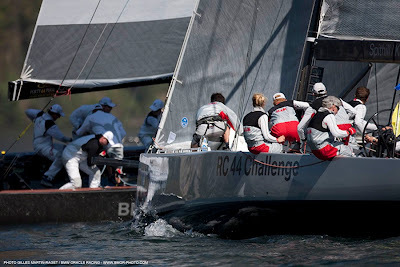 and RC44 Challenge (Jimmy Spithill, John Kostecki and co.). 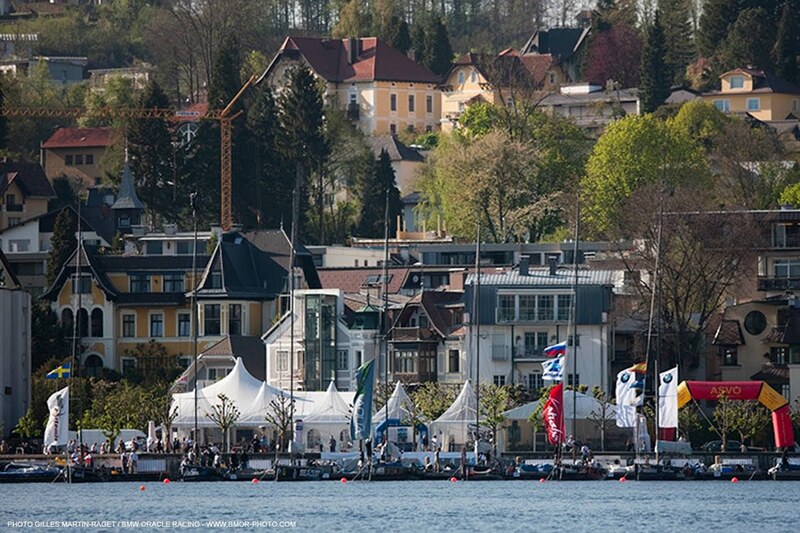 Update at 1615 CET: The unofficial results coming off the water have BMW ORACLE Racing beating RC 44 Challenge. We'll have images from today and interviews this afternoon/evening when the teams return to shore. 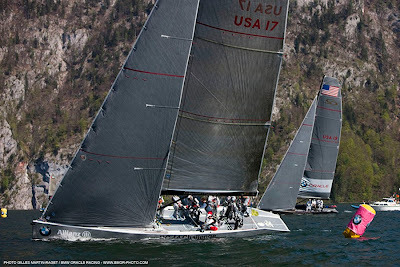 The RC 44 Austria Cup gets underway today and Flight 6 of the match racing portion of the event will be of particular interest to fans of the team. That's when BMW ORACLE Racing, with Larry Ellison and Russell Coutts in the afterguard, match up against the RC 44 Challenge with Jimmy Spithill and John Kostecki. Flight 6 is scheduled for Friday. 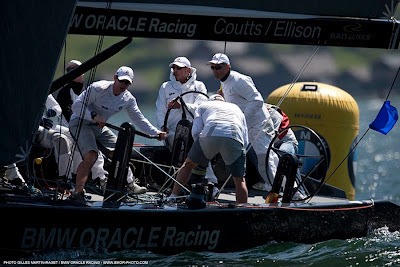 Today, both teams get underway immediately in the first flight, with BMW ORACLE Racing facing Team Sea Dubai, which won the match racing competition in the opening RC44 event of the season. RC44 Challenge is matched against Team Ceeref, a mid-fleet finisher in the opening regatta. Four flights of racing are scheduled although the wind this morning is very light. 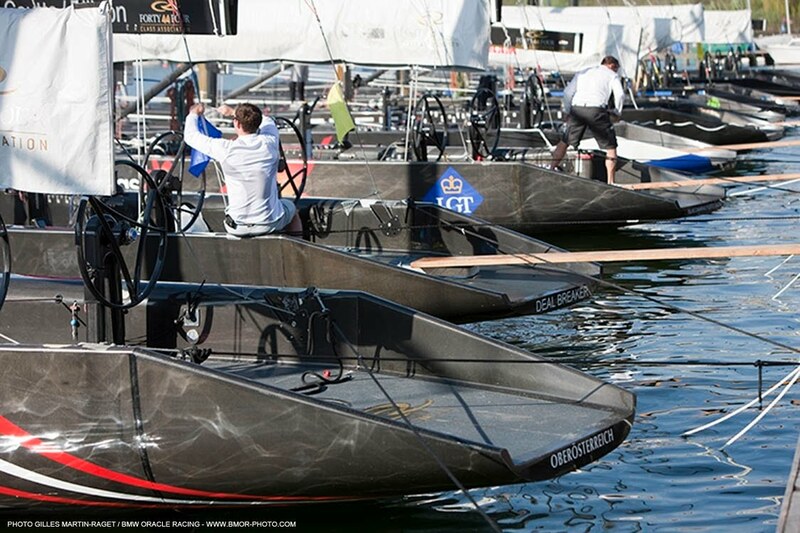 Gilles Martin-Raget will be out on the water doing what he does best, so we're sure to have great images. And I'll be speaking with the guys over the next few days to bring you some insight from the sailors as the team gets back into competition mode in a meaningful way for the first time since the America's Cup Match in February. 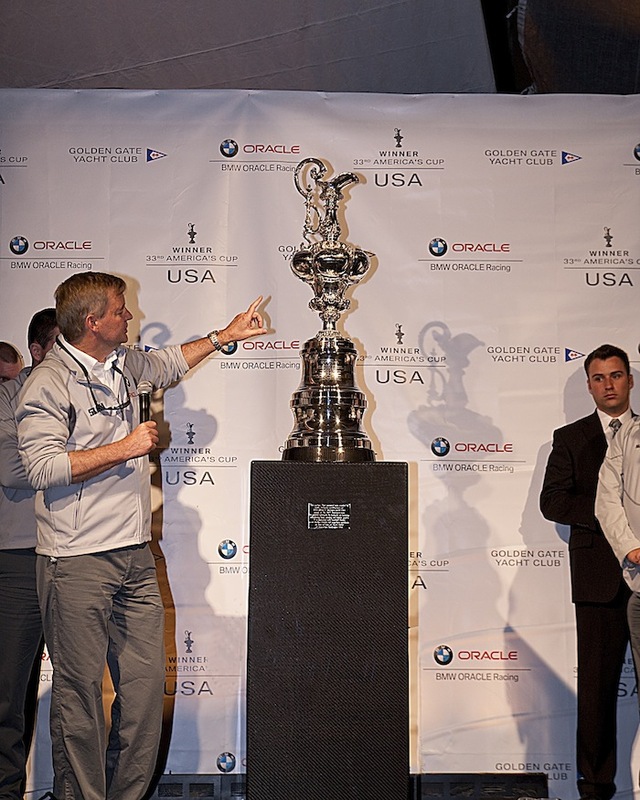 Team friend and journalist Kimball Livingstone has a nice blog post about BMW ORACLE Racing bowman Brad Webb making an appearance at BAMA - the Bay Area Multihull Association's boatshow. Brad went out for short sails with the public as seen in Kimball's photo above. 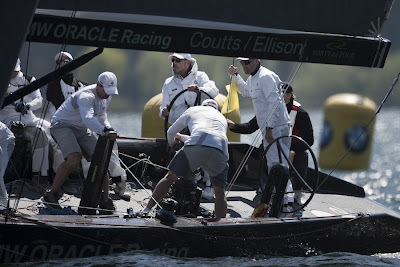 Larry Ellison, Russell Coutts, Jimmy Spithill and John Kostecki are among the sailors preparing to race in the RC44 Austria Cup which starts later this week. Today, photographer Gilles Martin-Raget was on hand as the guys headed out on the water for practice and tuning. We'll be reporting from Austria for the start of the event on Thursday. In the meantime, Spithill had this to say to the event website: "I am really looking forward to returning to the RC 44 Class. It attracts the world’s best sailors from both match racing and fleet racing, plus the boats are incredibly rewarding to sail and certainly one of the reasons I’m back. 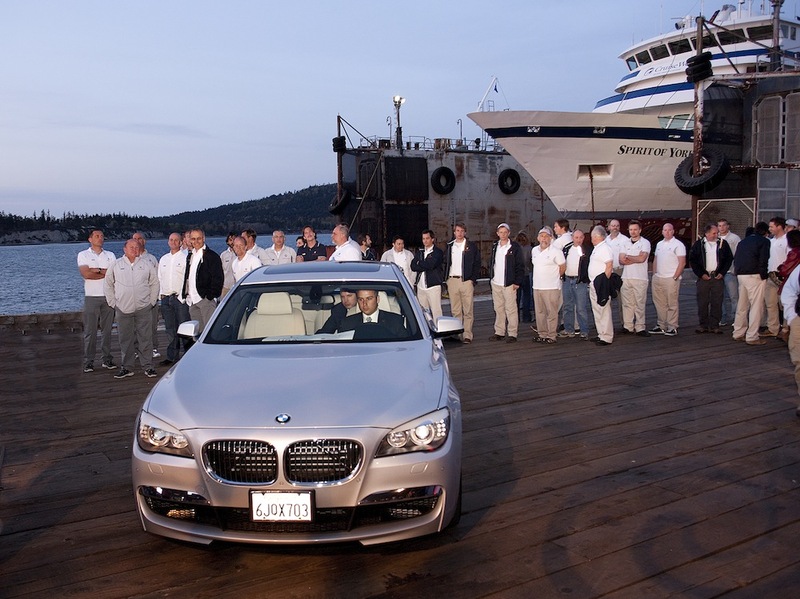 We have a fantastic team. 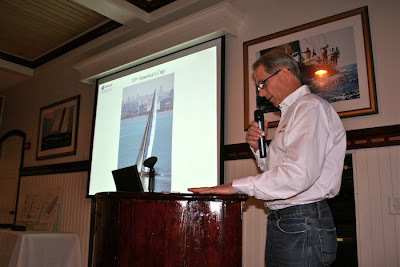 John Kostecki will be tactician and Joey Newton trimming, both who raced on the BOR 90 trimaran." 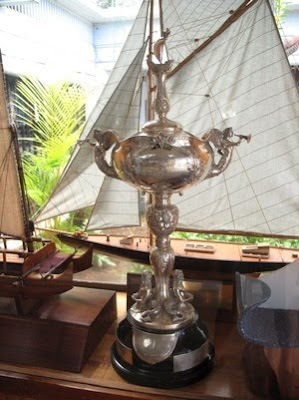 Incredibly, Sir Thomas Lipton challenged for the America's Cup five times between 1899 and 1930. His 'Shamrock' series of boats had a dismal combined record of 2-16 in Cup Matches, but Lipton, the consummate gentleman, was as popular in the US as he was at home. One of the reasons for this was his traveling throughout the country, where he would often donate trophies to local yacht clubs. Many clubs still hold challenges for their Lipton Cup, and over this past weekend, Waikiki Yacht Club successfully defended its title in Hawaii. See more in Ray Pendleton's story here. The May issue of Oracle Magazine has an in-depth feature story 'Sailing Home with the Prize' with design coordinator Ian 'Fresh' Burns who gives the background on some of the technology used by the team in its campaign. "The story of this race is in the technology," according to Fresh. 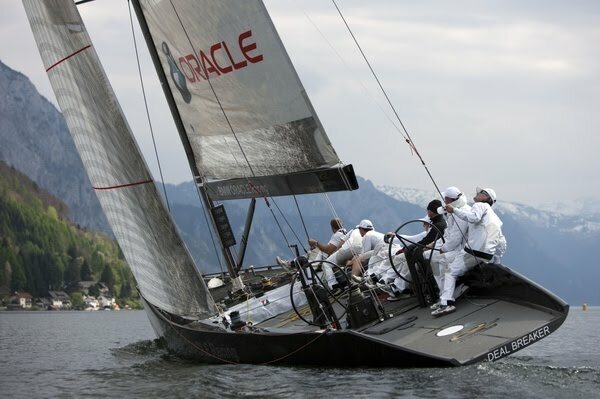 Data mining was among the many areas where Oracle contributed to the team's campaign. According to Burns, being able to sort, analyse and make sense of vast amounts of data was critical in a one-boat campaign like this one. "With Oracle database technology, we could compare our performance from the first day of sailing to the very last day of sailing, with incremental improvements the whole way through. With data mining we could check data against the things we saw, and we could find things that weren’t otherwise easily observable and findable." The full story, by Jeff Erickson, is here. 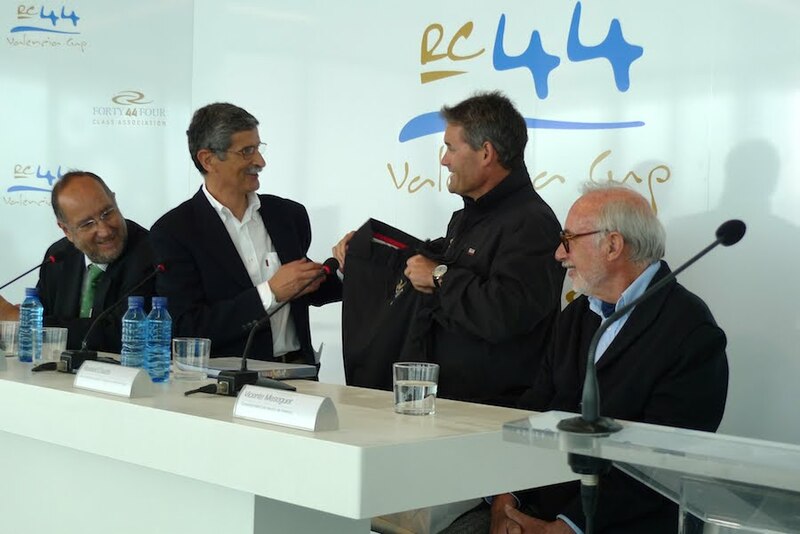 Team CEO Russell Coutts was wearing his RC 44 hat this afternoon at the Veles e Vents building in the Port of Valencia, where he was on hand to announce the RC 44 Valencia Cup, which will take place this summer from July 27th thru August 1st. It will mark the first time the class has held a regatta in Valencia, which has been the host city for the past two America's Cup Matches. 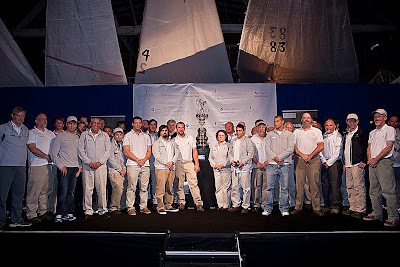 "Life will be coming back to the Darsena," Coutts, the chairman of the RC 44 Class said. 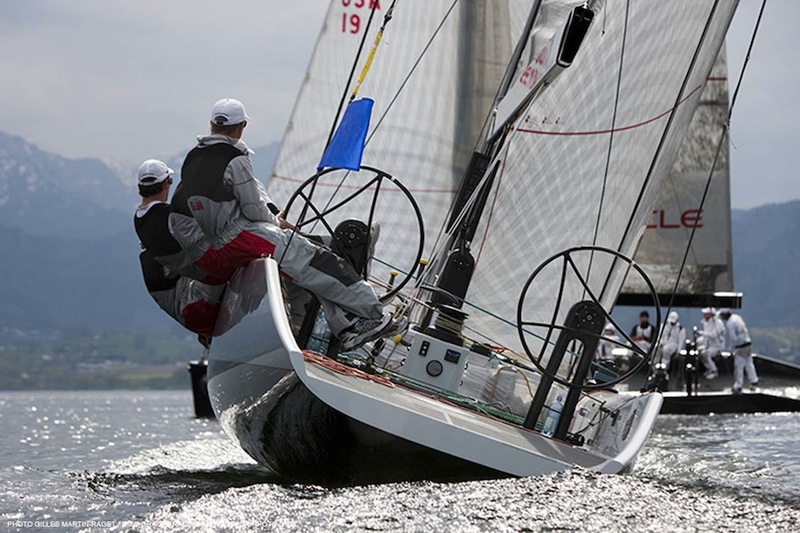 "Before the regatta, the teams will arrive; many normally practice practice for up to a week and then there are two days of match racing and three days fleet racing." 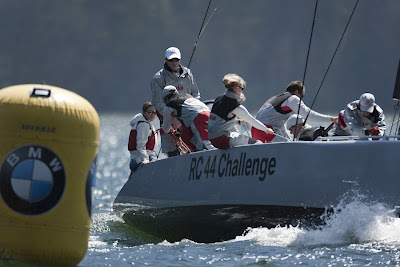 In contrast to the AC racing in Valencia, the RC 44 regattas are typically raced much closer to land, making for exciting viewing opportunities for spectators. Each regatta involves both match and fleet racing. "The racing will be close to shore. This is good for spectators and it allows us to swap guests between races," Coutts explained to the assembled media. "It is a class rule that there must be a guest or media person on board for each race, so I suggest you guys get your name on the list right now if you want to see first hand how Larry Ellison and I sail, or Paul Cayard and Torben Tornqvist operate!" The RC 44 Valencia Cup will begin with a match racing event. 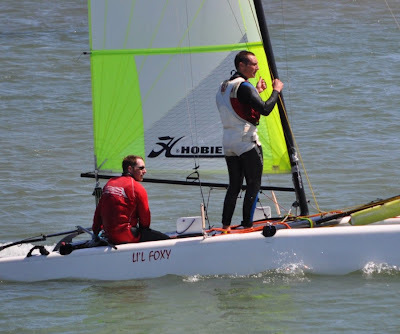 After a full round robin held over two days, team owners will take the helm for three days of fleet races. From the University of Washington's College of Engineering newsletter comes a nice story about alumni Peter Janicki (MS '89), whose company Janicki Industries was a critical collaborator in building the moulds for the structure of the wing sail. Janicki is quoted in the story as saying: "Whenever the human race enters a new age of materials — stone, bronze, iron, plastics — society advances. We are now in the age of composites, but still at an early stage. 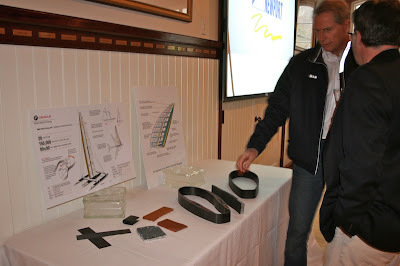 People all over the world are learning how to use these materials and the opportunities are huge. As composite technology advances, it will flow down to all kinds of products." The age of composites - that's where AC designers and builders have been living for quite some time already. From the ESPN website, Meri-Jo Borzilleri writes about the America's Cup visiting the Pacific Northwest. 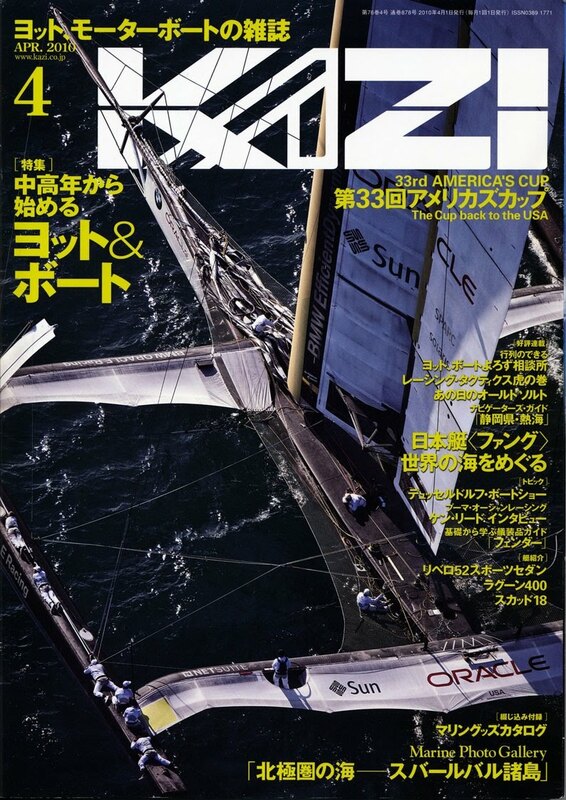 The Japanese magazine Kazi has published a multiple-page article on the 33rd America's Cup. As you can see from the cover, it's a photo driven story, with some great shots from the Match. If you read Japanese, check it out!! 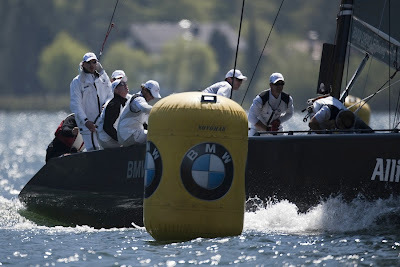 The BMW ORACLE Racing team will take to the water again at the end of the month for the RC 44 Austria Cup, the second regatta on the RC 44 Championship Tour. 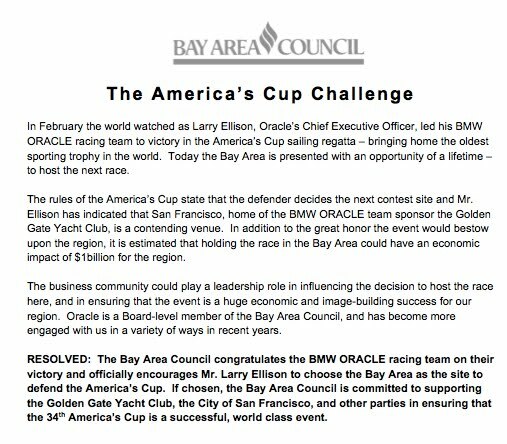 The team will have two boats competing, including Larry Ellison and Russell Coutts sailing under the BMW ORACLE Racing banner. 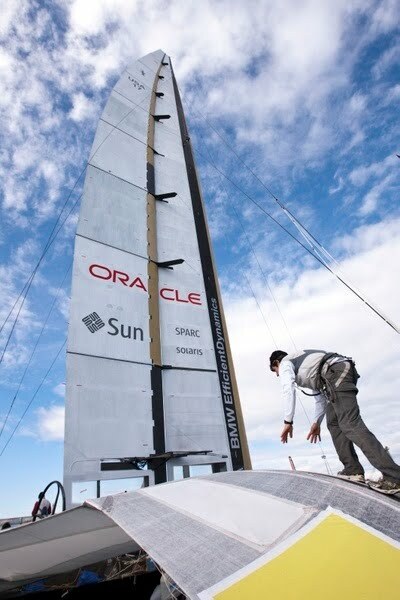 Jimmy Spithill will be racing on a boat currently going by 'Boat 17'. 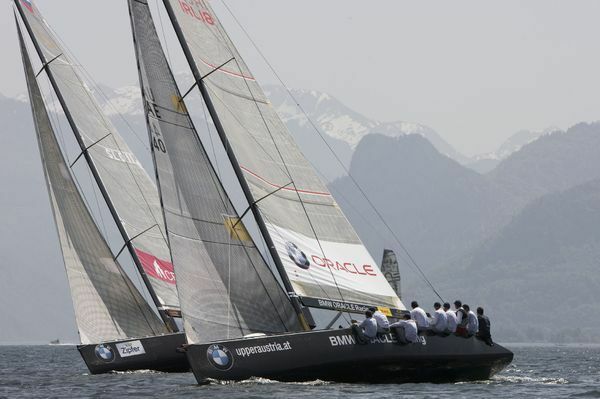 Crew from the larger BMW ORACLE Racing team will be sailing on both boats. See the full story on the team website here. Alejandra Mato, as many who follow our team know, is a linchpin in the organisation of our team. Her official role is as PA to CEO Russell Coutts, but her influence on the team is much bigger than that might indicate. 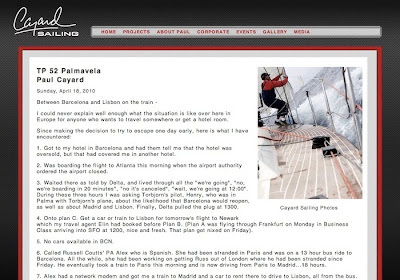 Here, a grateful Paul Cayard from Artemis explains how Alex helped him on Sunday as Europe descends into complete travel chaos due to the near total flight cancellations over the past (and next) few days. If you aren't here to experience it, it's difficult to describe just how complete the travel paralysis is across much of the continent. Alex isn't the only one working to keep our team members (and others!) on the move in very trying circumstances. So to everyone behind the scenes, a big thanks. As locals, they may be a little biased, but the response from people at the Strictly Sail Pacific Show to the question of 'Why San Francisco' from our TV team, was overwhelming. Take a look. 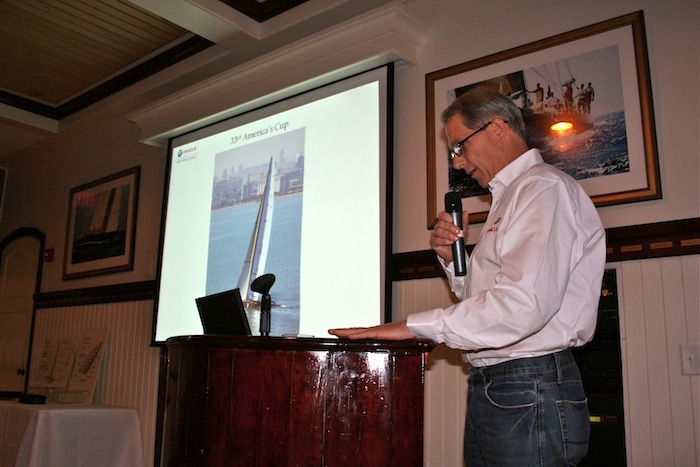 To a sold out audience, Jamestown's Scott Ferguson presented a facinating look at the development, construction and implementation of BMW ORACLE Racing's Wing Sail used in the 33rd America's Cup. "We needed a bigger room!" said Brad Read, Executive Director of Sail Newport. Grand Prix boat builders, designers, world champion sailors, daysailors, AC fans and AC veterans were rivoted to the detailed discussion of the largest solid wing structure ever conceived for a sailing craft. 'Ferg' shared the loading, construction, control mechonisms and well as dozens of great sailing stories. 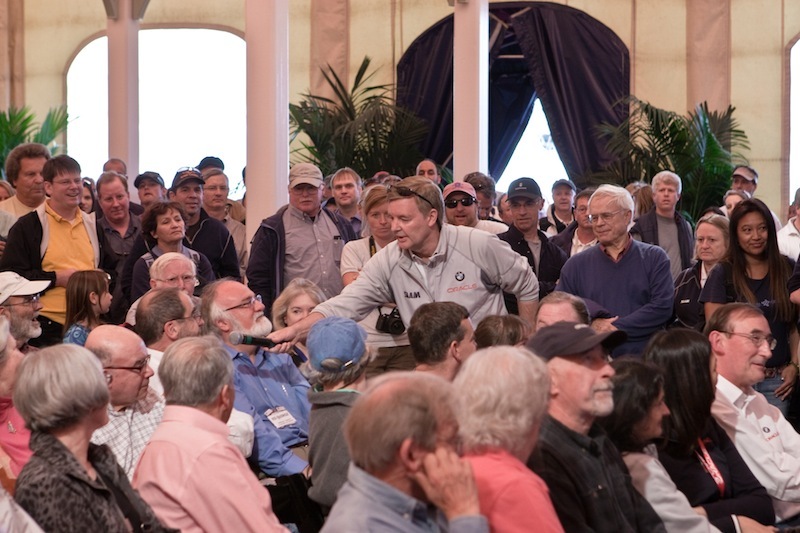 Scott was asked detailed questions from the audience and while answering he often checked in with his fellow marine engineers in the audience. 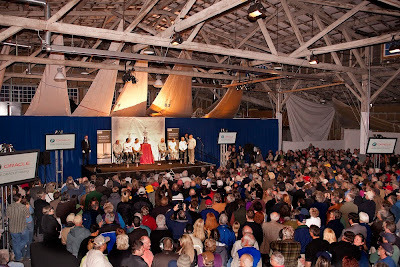 The human story of the design, build and sailing teams was what struck a cord with the audience. With the emotion of a Stanley Cup winner, a Super Bowl champion or a part of any winning team, Ferg let us all know what a monumental effort everyone associated with the BMW ORACLE Racing team had made. Immensly proud and humbled by the project. 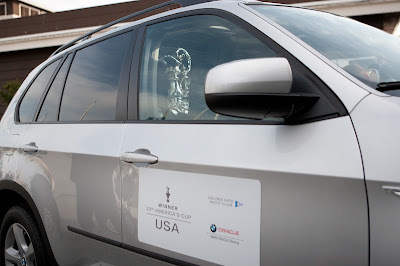 Thank you to Kim and Scott Ferguson and BMW ORACLE for this fantastic presentation. Thanks for the report Brad and to Kim Ferguson for the images. 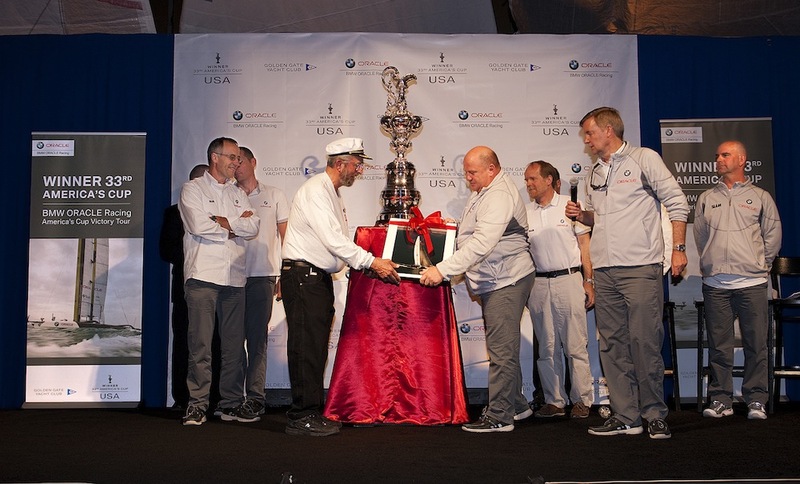 According to Master of Ceremonies Tom Ehman, the feedback from Thursday’s team and America’s Cup trophy appearance at Strictly Sail Pacific was that this was perhaps the best one yet. 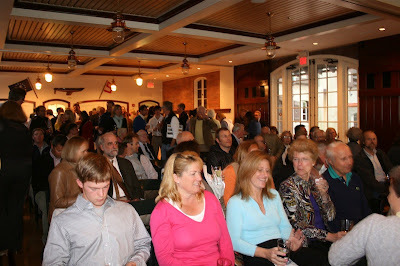 The venue was packed for the evening show, ‘tighter than standing room only’, with a knowledgeable and enthusiastic crowd eager to learn more about the team’s successful challenge for the 33rd America’s Cup. The Cup itself had arrived much earlier in the day, and was on display for the public just outside the show gates from noon until 7pm. Beginning at 5pm, tactician John Kostecki, bowman Brad Webb and design coordinator Ian ‘Fresh’ Burns (all of whom, incidently, are currently living in the greater Bay area) were on hand to sign posters and mix with the crowd. And from 6 to 7pm, the show was on with videos and a very popular Q+A session. 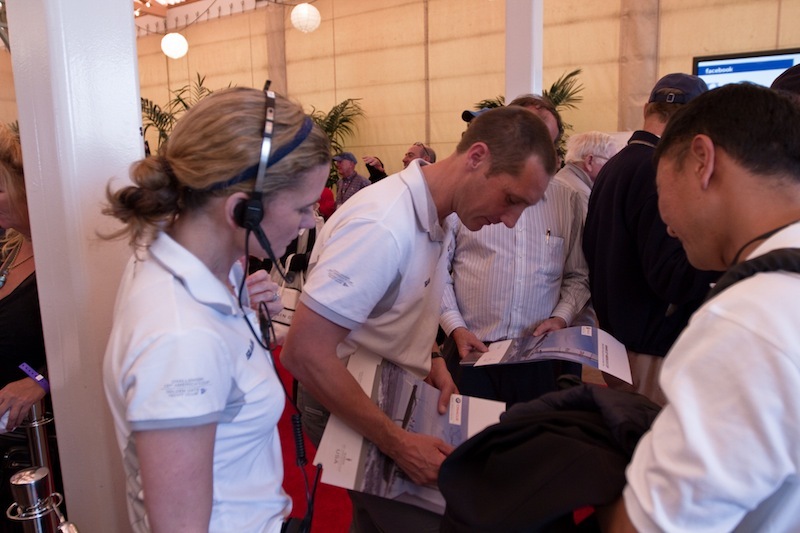 With so many industry insiders from the Strictly Sail show on hand, the guys fielded some of the most probing and in-depth questions they’ve faced since winning the Cup in February. Sail America president Sally Helme and Executive Director Jonathan Banks, who earlier had declared Thursday as ‘America’s Cup Day’ at the show, were both in attendance as was Latitude 38 Associate Publisher John Arndt. Thanks to all who came to see us on this leg of the Tour. 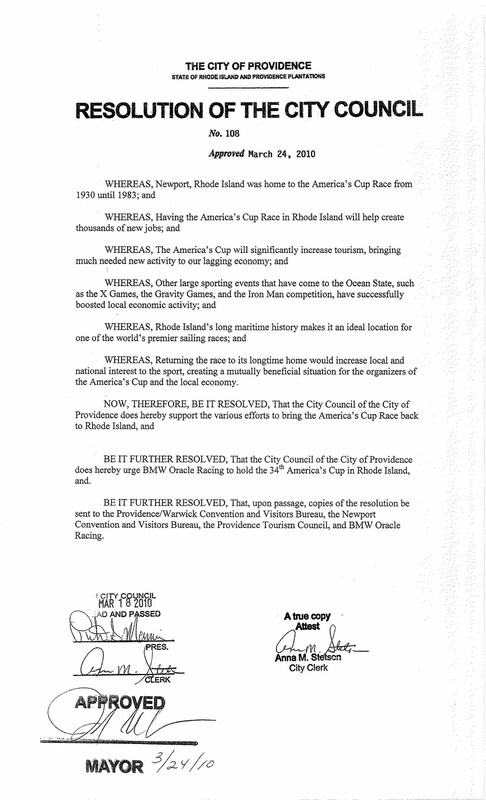 The full text of a resolution unanimously adopted by the Bay Area Council, confirming its support to holding the 34th America's Cup locally. Thanks to Ron Sellers for these images of the team and trophy at the Strictly Sail Pacific Show on opening day Thursday. Our good friends at SLAM, the official clothing supplier for BMW ORACLE Racing, have shared their enthusiasm for the team with the action-packed YouTube video below. And if you're looking for SLAM gear, you can visit the online store via the main team website here. 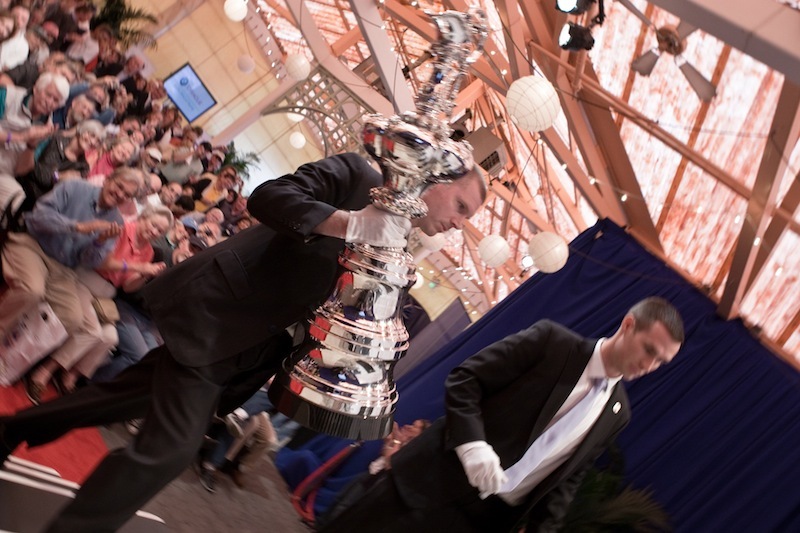 The America's Cup trophy, as well as some high-profile team members, will be at the Strictly Sail Pacific show in East Bay - the West Coast's largest sail-only boat show. The Cup will be in Jack London Square as part of the show from noon until 7pm. From 5pm, team members Ian Burns (AUS, Design Coordinator) and race crew members Brad Webb (NZL, Bow) and John Kostecki (USA, tactician) will sign free team posters. 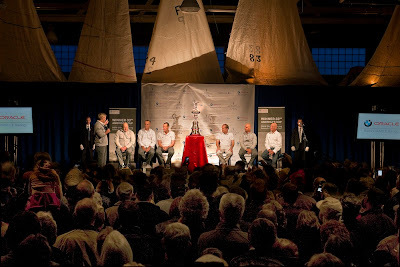 This will be followed at 6pm by a public presentation and ceremony including video from the 33rd America’s Cup, Q&A session with members of the winning race crew and design. 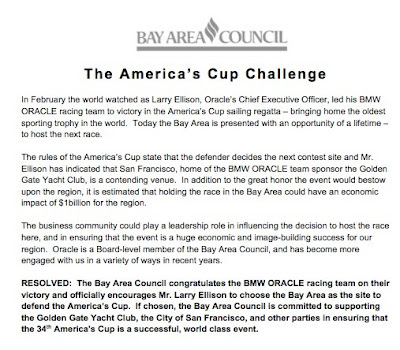 It's sure to be a great afternoon as the team is keen to reciprocate the outpouring of support from the East Bay for the team’s victory in the 33rd America’s Cup. 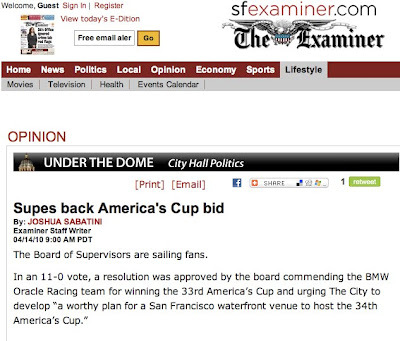 And it seems the feeling is mutual, as reported in the SF Examiner below. One of photographer Neil Rabinowitz's favourite shots from the weekend. 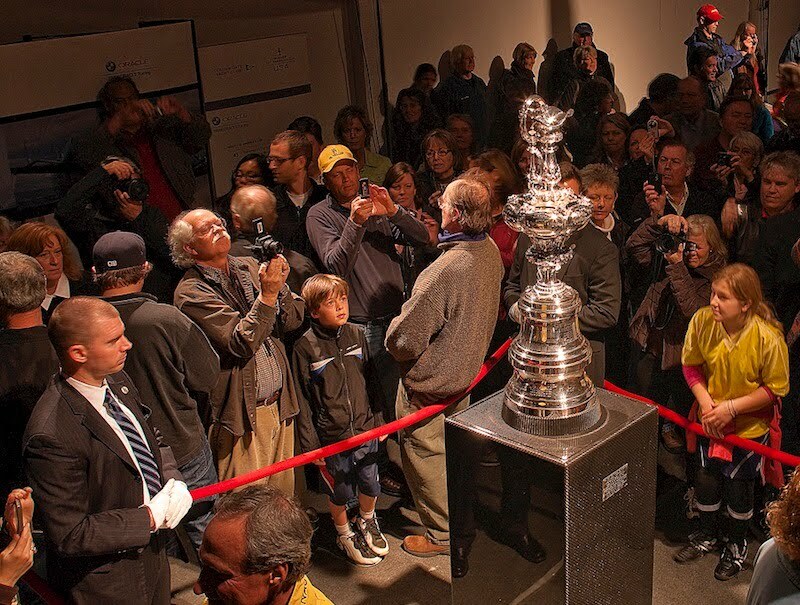 The America's Cup trophy - with its new carbon-fibre base and platform - is the centre of attention, drawing in both young and old. Simone de Mari (ITA), who worked the pit position on USA during the Match, is featured on the cover of the Italian 'For Men Magazine'. 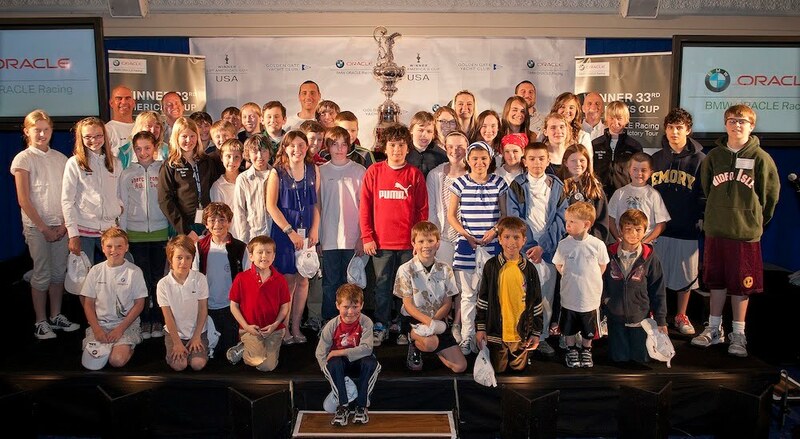 The kids came out in force on Sunday afternoon at the Seattle Yacht Club to meet the BMW ORACLE Racing team and talk about all things America's Cup. In a crowd approaching 100 (there were quite a few parents in there too! ), the America's Cup trophy was front and centre as the juniors grilled the panel in an engaging Q+A session. Tactician John Kostecki and bowman Brad Webb, design coordinator Ian Burns and designer Paul Bieker, along with Chris Sitzenstock from the build team were asked about everything from the difference between the wing sail and soft sail, to how they started their careers. Tom Ehman was on hand to preside over the session and direct the deluge of questions from junior sailors like Adam Krzeszowski, an 11 year old Optimist sailor, who wanted to know why the team elected to build a trimaran for its Deed of Gift battle against Alinghi. Following the Q+A session, the guys happily signed posters and engaged in some one on one banter with the kids in what was a very enjoyable experience for both the juniors and the team. Then, in the evening, there was the more formal programme for a sold out house. 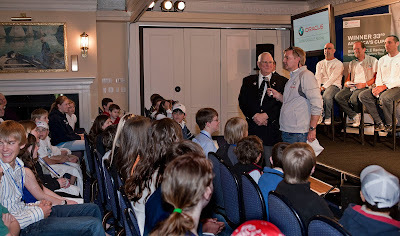 Videos, more Q+A and perhaps most importantly, an auction of team gear and memorabilia to raise money for junior sailing, with Staff Commodore Chris Otorowski presiding. The grand total approached $10 000 raised, with a spot as 'ninth man' on board BMW ORACLE Racing at the RC 44 regatta in Copenhagen the biggest ticket item. It's been a great weekend for the team in the Pacific Northwest and we'd like to extend an enormous thank you to everyone involved in Anacortes and Seattle. And thanks to John von and his video team for capturing the moment. And of the SRO crowd in the Pier One Warehouse facility. 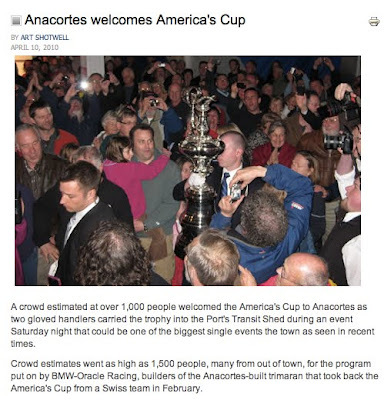 The occasion was a visit from the America's Cup trophy to Anacortes, a chance for the team to pay tribute to a town that has been home to its boatbuilders for the last two America's Cup campaigns. 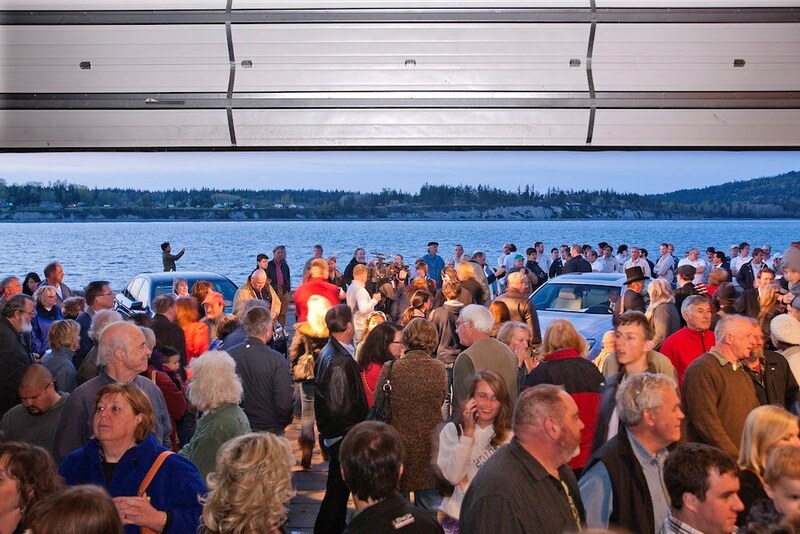 A crew from Core Builders, about 40 strong, was on hand to bask in the glow of their achievements while the venue - the Pier One Warehouse on Commercial Ave. in Anacortes - was standing room only. 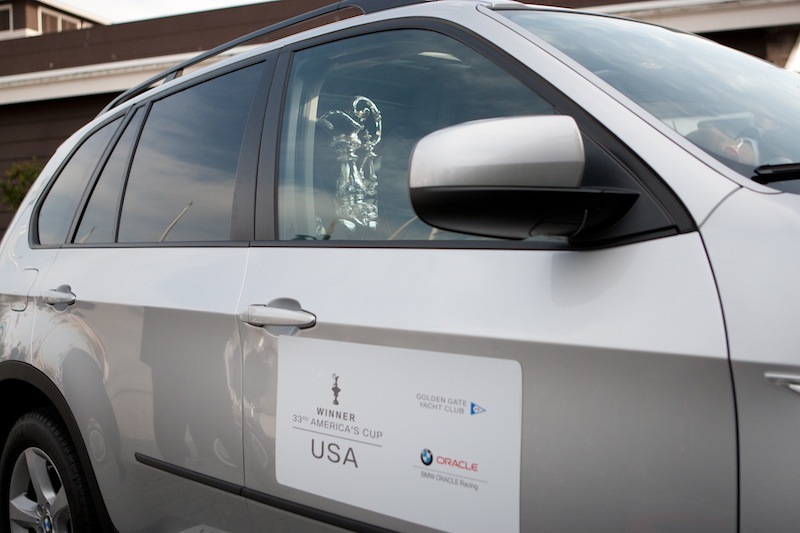 The America's Cup trophy arrived down Commercial Avenue in a silver BMW 750 Li (what else), with team members and boatbuilders keeping pace alongside. 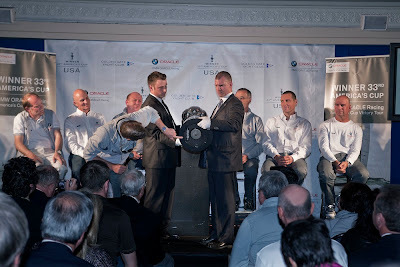 The Cup was then placed on stage by its security detail where MC for the night, Tom Ehman (who else! ), kept the banter up between the team and the crowd all evening long. Kris Breckenridge, a born and bred Anacortes boat builder with Core Builders, says he was blown away by the size and enthusiasm of the crowd. "It was really amazing to see that kind of support from the community, to see that level of enthusiasm for the America's Cup. It's a special night when you have everyone get behind a project that you've spent so much time on." 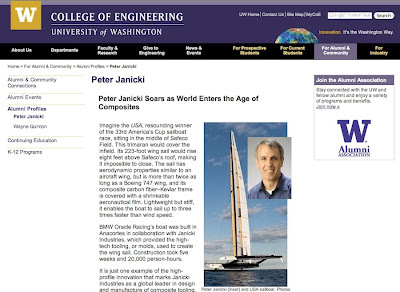 Paul Bieker, a local legend in design circles and a member of the BMW ORACLE Racing design team, was asked by Tom Ehman for his thoughts when he first saw the plans for the towering wingsail (the team made the decision to build it one year ago this week). "When I saw the drawings and realized how big it was going to be, and how much work would be involved, I just took a big gulp, and signed on!" Joining Bieker on the panel were Ian 'Fresh' Burns, to round out the design section, John Kostecki (tactician) and Brad Webb (bowman) representing the sailing team, and Mark Turner and Tim Smyth, the co-leaders of the build team, who made a special point of paying tribute to their guys who put so many hours of work into the 33rd America's Cup and their families, who made it possible. They weren't the only ones. 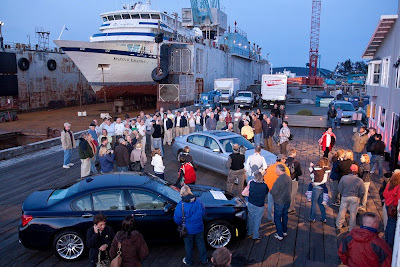 Anacortes Mayor Dean Maxwell presented a key to the city to the build team while the Anacortes Yacht Club also made a presentation in recognition of the team's achievement. And as a final tribute to the boat builders, when the America's Cup was placed on stage, the pedestal it stood on was shrouded in red satin. This was later pulled away to reveal a hand-crafted, carbon-fiber pedestal, built, where else, but here in Anacortes. Where to start? 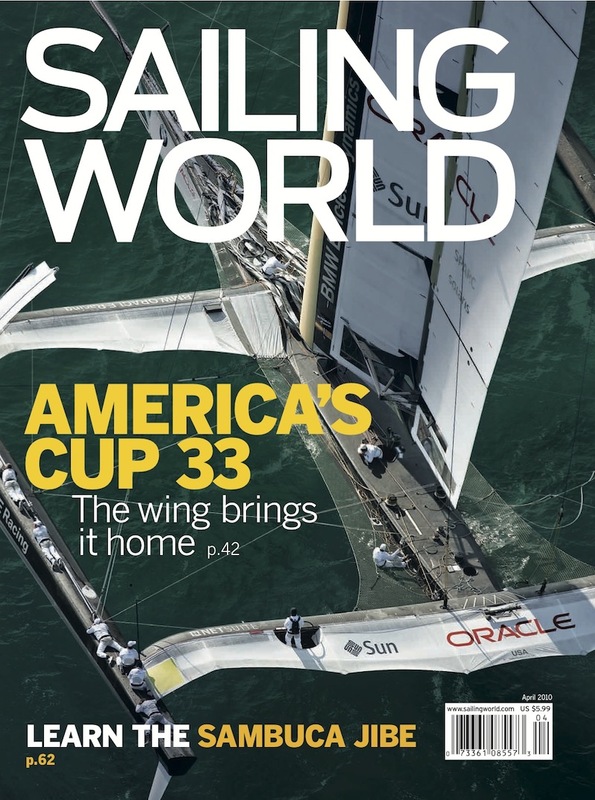 Monthly magazines with in-depth reporting on the 33rd America's Cup Match are beginning to dominate the newsstands. 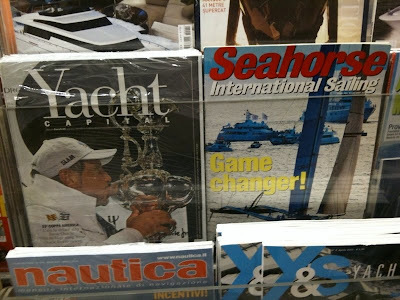 From Sailing World with Stuart Streuli's in-depth reporting, to Yacht Capital and Seahorse (as seen in Milan's Malpensa airport by Tom Ehman). 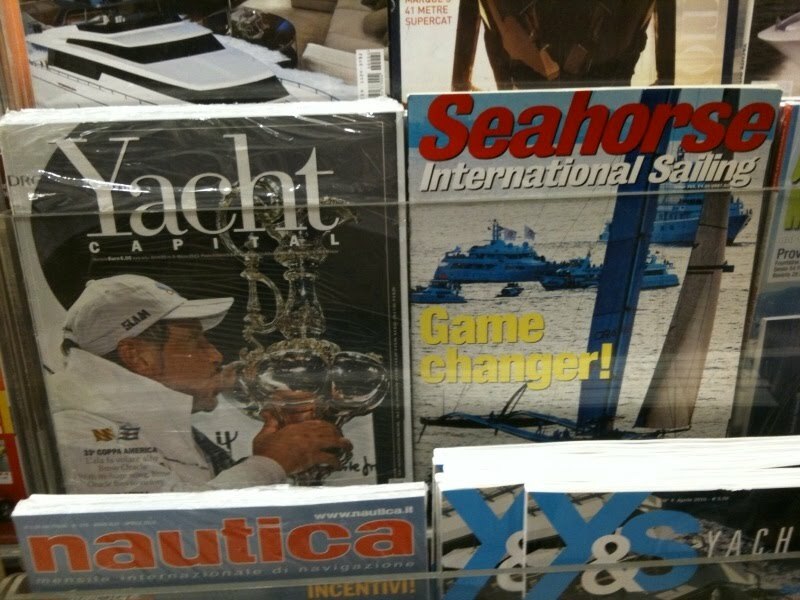 A digital version of YachtWorld magazine is available here.